Kick off your visit on the 20th (Sat): explore the activities along Surwal Lake. To see other places to visit, photos, ratings, and tourist information, refer to the Ranthambore National Park journey builder app . Bhopal to Ranthambore National Park is an approximately 6-hour flight. You can also drive. Wrap up your sightseeing on the 21st (Sun) to allow time to travel to Jaipur. Get some cultural insight at Amber Palace and Jantar Mantar - Jaipur. Get outdoors at Nature & Wildlife Tours and EleSafari. There's much more to do: get engrossed in the history at City Palace of Jaipur, stop by Royal Spices And Tea, and identify plant and animal life at Amer Jeep Safari. To find photos, maps, traveler tips, and more tourist information, use the Jaipur trip itinerary planner. Traveling by combination of taxi and train from Ranthambore National Park to Jaipur takes 3 hours. Alternatively, you can drive. In July in Jaipur, expect temperatures between 40°C during the day and 30°C at night. Finish up your sightseeing early on the 24th (Wed) so you can travel to Jodhpur. Start off your visit on the 25th (Thu): steep yourself in history at Phool Mahal, steep yourself in history at Mehrangarh Fort, then look for gifts at Mohanlal Verhomal Spices (MV SPICES), and finally browse the exhibits of Umaid Heritage Art School. Get ready for a full day of sightseeing on the 26th (Fri): take an exotic tour of a safari tour, then head outdoors with Outdoor Activities, and then admire the masterpieces at Umaid Bhawan Palace Museum. 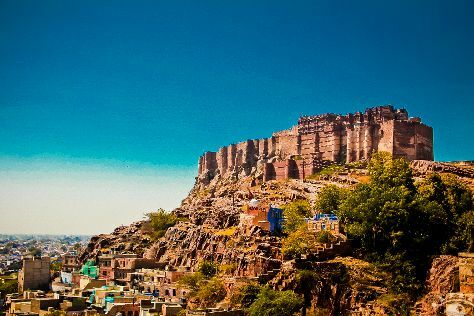 To find reviews, other places to visit, maps, and tourist information, you can read our Jodhpur itinerary planner. You can fly from Jaipur to Jodhpur in 4 hours. Alternatively, you can drive; or take a train. Expect a daytime high around 41°C in July, and nighttime lows around 32°C. Finish your sightseeing early on the 26th (Fri) so you can travel back home.